Be the first to share your favorite memory, photo or story of Michael . This memorial page is dedicated for family, friends and future generations to celebrate the life of their loved one. 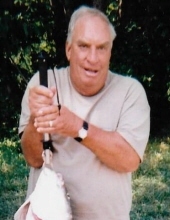 A Taylorsville resident, Mr. Michael Patrick Inman, age 75, passed away Friday, March 29, 2019 in Signature Healthcare of Spencer County. He was born November 26, 1943 in Spencer County to the late David and Mary Alice O’Brien Inman. Michael was a Master Plumber, was a plumbing supervisor for the Kentucky Fair & Exposition Center, and was of the Baptist faith. He was a United States Air Force Veteran, a 32nd Degree Mason, a member of the Taylorsville Masonic Lodge #210 F.&A.M. where he was a past Master, and was a past President of the Spencer County Ruritan Club. Along with his parents, he was preceded in death by his son, Mark Inman, and 2 sisters, Geraldine Prickett and Katherine Inman. He is survived by his wife, Nancy Duvall Inman, his daughter in law, Andrea Inman (Tim Carney) of Taylorsville, and his grandson, Collin Inman of Lexington. Funeral services for Mr. Michael Inman will be 11:00 am Tuesday, April 2, 2019 at the Greenwell-Houghlin Funeral Home in Taylorsville. Bro. Chad Goodlett will officiate. Interment will be in Valley Cemetery. Visitation will be Monday from 5:00-8:00 pm. A Masonic memorial service will be Monday evening at the funeral home. The Greenwell-Houghlin Funeral Home is in charge of arrangements. To send flowers or a remembrance gift to the family of Michael Patrick Inman, please visit our Tribute Store. "Email Address" would like to share the life celebration of Michael Patrick Inman. Click on the "link" to go to share a favorite memory or leave a condolence message for the family.